We received a new box of children's books from Scholastic Books for review. Inside were a couple new LEGO books which are always an exciting find for our children. LEGO books like these, I find, are rather novelty in style. They really are not great story telling, most of them being laid out comic book style. They give off the same feel to me as the LEGO Movie did (and let's just say that that wasn't my favorite movie). It's not really so much about the book or the story though as it is about LEGOs. That's the main point and its safe to assume that each of these books were enjoyed. 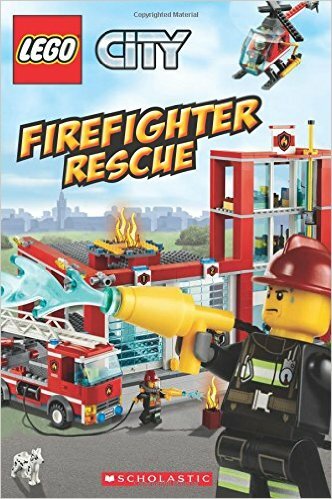 LEGO City Firefighter Rescue is an illustrated book (not photograph pictures) that tells us the story of Ricky who is a firefighter-in-training. Ricky is learning all about what firefighters do to protect society, from fighting fires to shoveling and salting sidewalks. (Now, I don't know that firefighters really salt the sidewalks but apparently they do in LEGOland.) This is your typical LEGO city book and really not much to say about it. If your kid is a LEGO city fan (I always favored the City series) then they'll probably like it. 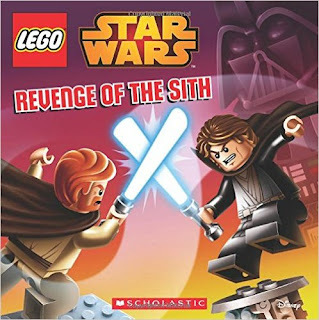 LEGO Star Wars: Revenge of the Sith is also illustrated and, if you've seen Star Wars Episode III then you know what it is about. This story is told comic book style and there are lots of light sabers and corny jokes. All very Star Wars. This is one of those moments in time when you give your kid a book for the simple reason but that it's fun and they find pleasure and enjoyment in it. Neither of these books represent fine literature, but they do contain LEGOs and that brings joy. So I don't mind them so much. I know this post is not a ringing endorsement, unless you understand how much my kids love playing with LEGOs and how willing I am to let them enjoy books which foster this love. So many thanks to Scholastic Books for sending copies of the above two titles in order to facilitate this review. I received no additional compensation and all opinions expressed are entirely my own. Hmm...I'm also a firefighter in my off hours, and I can't say I've ever salted a sidewalk...but, we do try to help the community out, so who knows? My son was always a voracious reader, and loved Legos, but Lego books did not exist when he was young. He would have eaten them up! If you ever get to choose your books from Scholastic, we've enjoyed the National Geographic Kids books about various animals.